The previous post discussed preparing the edge joint for thin boards. The second problem involves clamping the joint. Because these are thin boards it is desirable to align the edges as accurately as possible to avoid a significant loss of thickness in the final product. More vexing is the tendency of the joint to explode when clamping pressure is applied. This problem is akin to trying to control the writing tip of an 8 inch long pencil held only by the eraser. I like #20 biscuits for aligning 3/4″ edge glue ups and #0 biscuits could work for ½” boards, but for the 11/32″ boards shown here I would be concerned about biscuit swelling and show-through. Splines are a hassle which I gave up on long ago. The same goes for those elaborate clamps that use wooden battens to apply pressure on the face of the glue-up while the clamp screws apply pressure to the joint. 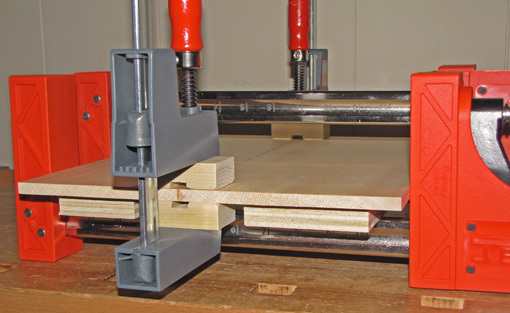 One option that I have not tried but looks good is the Plano Clamping System. Here is a simple solution that works for me. The boards rest on 3/4″ MDF or plywood platforms. After applying glue and bringing the joint together, I apply just light pressure with the bar clamps. Then I clamp small blocks, with cutouts to vault the glue squeeze-out, across the joint near the ends. I push or tap near the middle of the joint to align it there. Then I apply final pressure with the bar clamps. There are surely many other methods for edge joining thin stock, notably from instrument makers. I’ve described simple, shop-tested methods that I use. Best wishes for your woodworking. I like this method. I just got through doing some glue-ups for some drawer bottoms of ~7/16″ stock. I used a quick grip clamp at each joint to align them. However I like your method of adding the clamping blocks. That avoids the additional smearing of glue on the surface of the pieces by the clamps. By the way, that exploding of the joint is a real annoyance…don’t ask me how I know this! Joints that explode??? Rob, are you mixing your own glue again? Seriously, though, thanks for the tip! I tend to work with thinner stock with the boxes I make. I can usually find thin boards wide enough that I don’t ever have to glue up panels, but I’ll keep your technique in mind for the occasion when I can’t. In addition to the mess, I wonder about proper drying and joint strength with a clamp covering and squishing the glue line. What clamps are those big red ones in the photo? Your method is similar to David Charlesworth’s, except that he has special support blocks that rest on the bench/glue-up table, independent of the clamping bars (on which you’ve placed the plywood pieces). The key aspect is to have the clamping force perpendicular to the surface, which is often problematic with clamping bars that curve under pressure. I suspect your clamps are those that maintain parallel. I need a bunch of those! A friend of mine who is a great luthier uses a simple system for his backs and tops without clamps, just a flat board with a fixed fence on one edge and wedges against a parallel board that can be changed to accomodate the board’s width. It works over and over again perfectly, which makes me wonder about how much force is really required, given that you have carefully shot edges that almost want to go together in the first place after a few rubs back and forth with a thin glueline. Those are Jet clamps. I like them. The new version of Bessey’s parallel clamps look very good too but I’ve only checked them out in the store, I don’t own any. I am familiar with the method used by your luthier friend and that is what I had in mind in the last paragraph of the post. I did not write about it because I have very little experience with it.